Lori and I spent the week of Thanksgiving in Aptos, a little town just south of Santa Cruz (actually it’s east of Santa Cruz, but you have to go “south” on Highway 1 to get there), in our vacation house just a 10 minute walk from the beach (Seacliff State Park). It was a great week from a weather point of view, with only one day of rain. There were great sunsets, as you see above, and great ocean views. 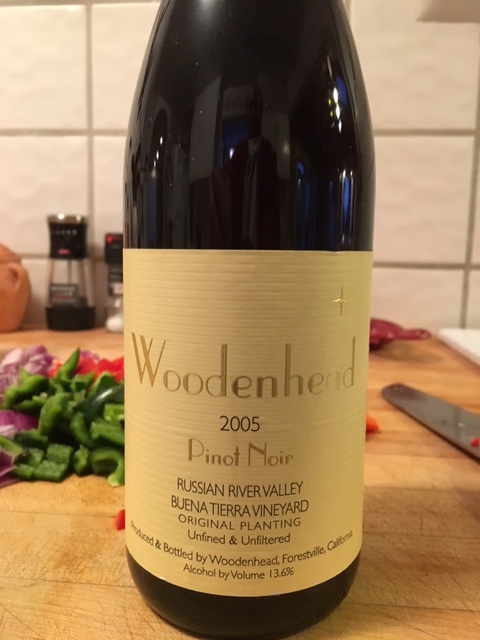 Woodenhead Pinot Noir: This is a small winery in the Russian River Valley (RRV), specializing in Pinot Noir. We did an interview with Zina Bower, the co-owner, in the early days of the ViciVino.com website. This bottle was what I like to think the RRV does best, Pinot Noir with some restraint, delicacy and subtlety. After 10 years this wine was all we expected, balanced from nose through entry through mid-mouth through finish. Not real heavy bodied, it went great with a shrimp stir fry we cooked on the barbeque. We have consistently liked their Pinot Noir; unfortunately this was our last bottle. Time to go up and buy a few more. Crosshatch: This is the brand name for some interesting blends from Carr Vineyards & Winery in Santa Barbara. We enjoyed our visit to their tasting room this past summer, and really loved how they handle Rhone varietals. The reds we bought — Syrah and Grenache — will sit for another few years, but this white was ready now. 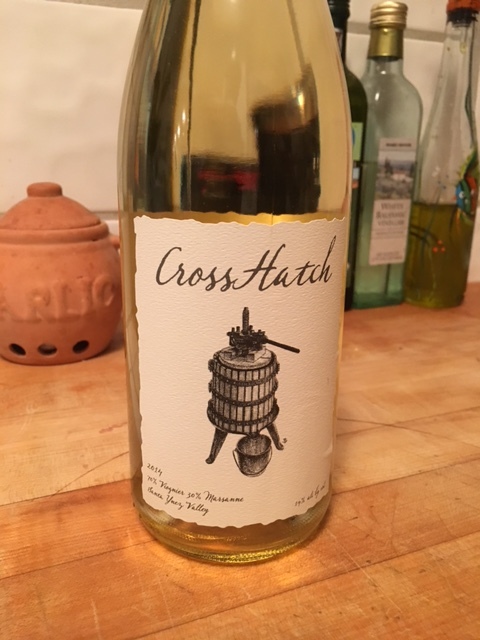 The Crosshatch white blend is 70% Viognier, 30% Marsanne, and was delicious. Definitely ready to drink. 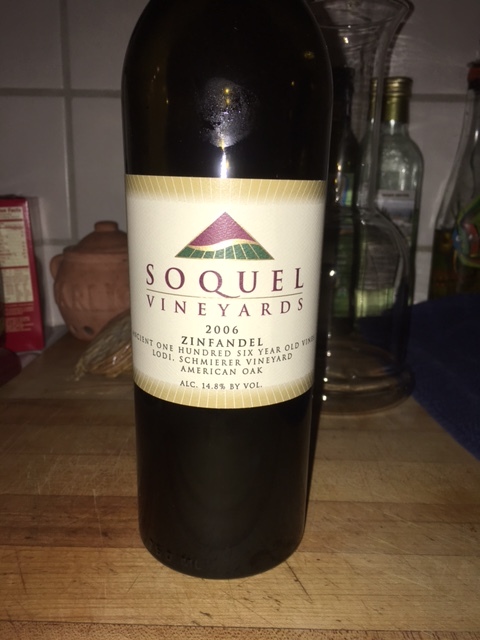 Soquel Vineyards: We’ve mentioned Soquel Vineyards a few times before in blogs, including writing about the 2004 vintage of this same Zinfandel. Soquel consistently produces excellent wines, and their tasting room is a great experience. The 2006 Zinfandel was lovely, sort of the “Mama Bear” wine: Not too big, not too soft, aged just right for drinking over the holiday. This entry was posted in wine travels and tagged Carr Winery, Crosshatch, Lodi, Pinot Noir, Russian River Valley, Santa Ynez Valley, Soquel Vineyards, Thanksgiving, Woodenhead, zinfandel on December 26, 2015 by vvblogman. Lori and I spent a week in England in December. One of those business/vacation trips, which ended up being great. We were staying in a small town, Thame, which is near Oxford, and is where my day job company is located. Two days Lori took the train into London, with me joining her there in the evening. One of those evenings was a theater evening (Billy Elliot), while the second was to meet with friends that we hadn’t seen in a number of years. After wandering around a Christmas market near the Millennium Bridge, we went to the OXO Tower Restaurant (only 8 floors up to the top of the tower, but still a pretty good view overlooking the Thames River and London). The restaurant has a very good reputation. 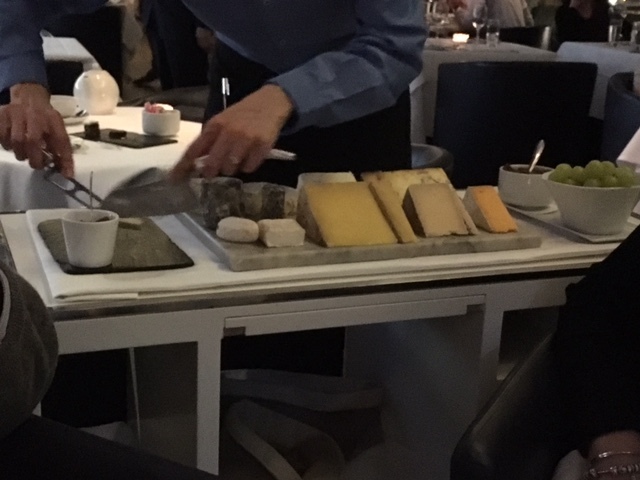 The food was very good, and the service was excellent, except for the sommelier. 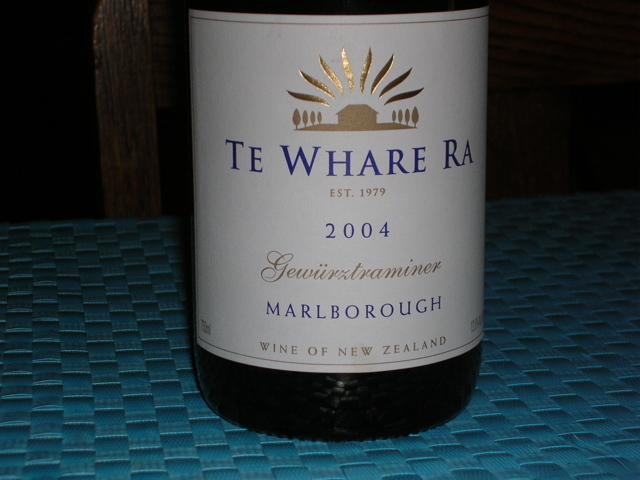 After looking through the wine list I found a bottle of Te Whare Ra 2010 Syrah, from Marlborough, New Zealand. The sommelier tried a couple of times to talk me out of this bottle, suggesting both South African Syrah and Australian Shiraz as alternatives with bigger, bolder flavors. But I didn’t want that – didn’t want bigger, bolder Syrah with the mix of meals we were getting – and I did want the Te Whare Ra bottle. When we visited New Zealand in 2005, and visited the Marlborough area where Winemaker B and then-fiance-now-wife Kim were spending 6 months (Winemaker B’s first post-UC Davis graduation job was in Marlborough), our favorite winery was Te Whare Ra. The name is pronounced Tea Far-ee Ra, and means house of the sun in Maori. There was a young couple running the place; I seem to remember twins about 1 year old at the time. This couple really knew what they were doing around wine. They made the standard crisp Marlborough Sauvignon Blanc, but also made a Gewürztraminer that we all loved. I don’t remember much about red wines, but anyone that can make a good Gewürztraminer can make almost anything. That was proved out with the 2010 Syrah. Not so big and bold, but lighter, smooth with a good balance between fruit and acids. It went great with our dinners. Wine is about people and place and time, as well as about the wine itself and the food being enjoyed with the wine. This was a reminder of New Zealand 10 years ago, and now has a place in our memory with our friends Chris and Catherine with whom we enjoyed this wonderful bottle and meal. 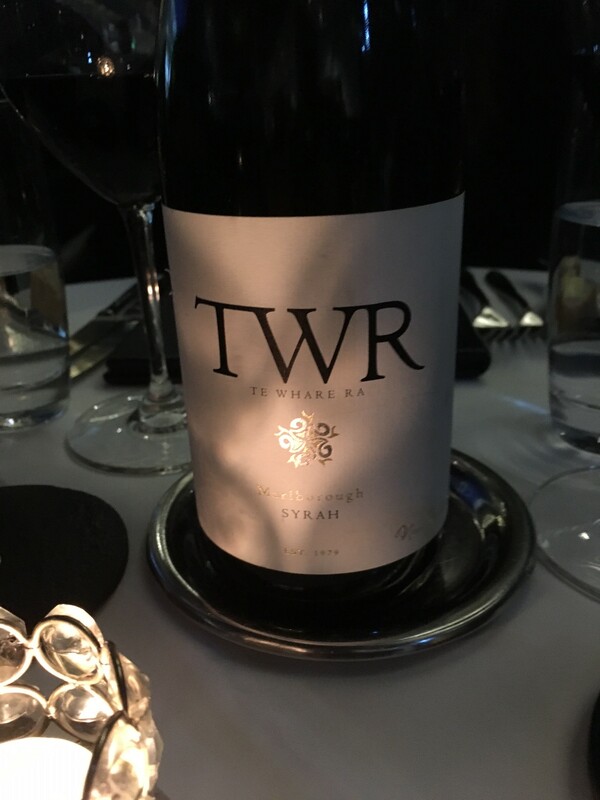 This entry was posted in wine travels and tagged gewurztraminer, London, Marlborough, New Zealand wines, syrah, Te Whare Ra on December 24, 2015 by vvblogman.